The coarse coat is generally dark brown, although the color is richer in the summer (dark rusty-brown or coffee-colored) and paler (more greyish) in winter. The undersides are very light in color, and the short tail is white underneath. The outer layer of guard hairs in the coat may be 5-7 cm long in the winter, and 3-4 cm long in summer. Huemuls have relatively short legs which accentuate the hunched back. 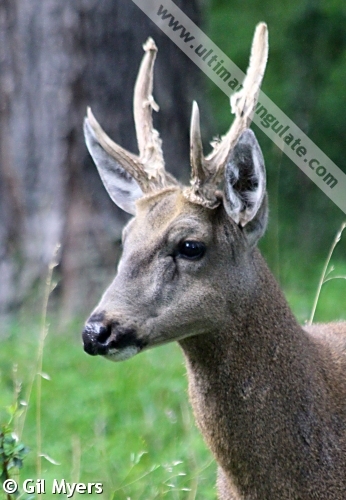 Male huemul have a dark stripe on the bridge of their nose, which forks in between the eyes and forms a pair of dark eyebrows (females may have this blaze, too). The large ears are sometimes described as "donkey-like". 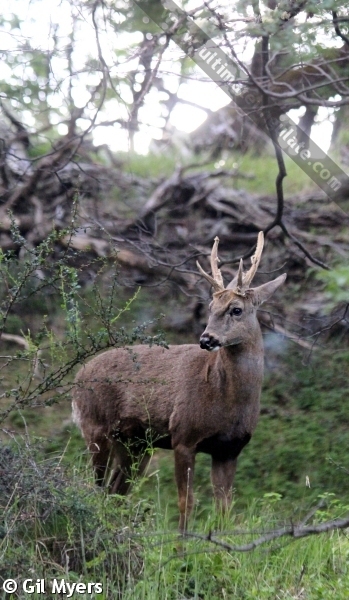 Only males grow antlers, which usually have a single branch. 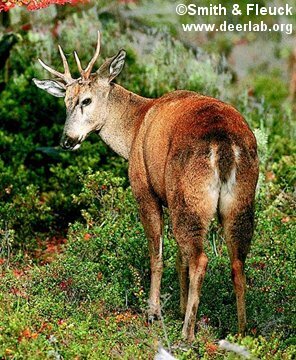 The rear tine is usually longer, growing 30-35 cm from the antler base. 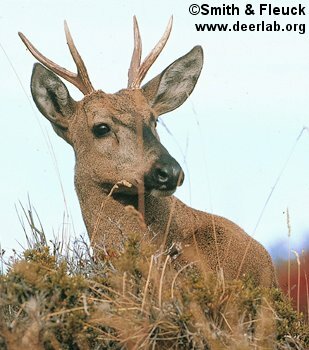 The taruca (Hippocamelus antisensis) is easily separated from the Patagonian huemul by range in the wild. 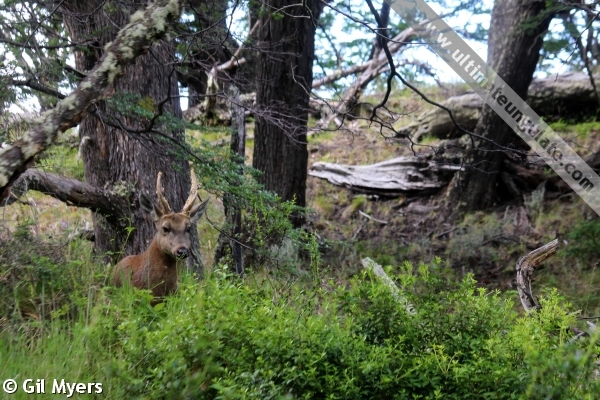 Physically, taruca tend to be smaller and lighter in color than Patagonian huemul. Gestation period: Reports vary; probably around 7 months. Sexual maturity: As early as 6 months. Life span: Up to 14 years. The breeding season is between February and May, with most babies being born in November/December. 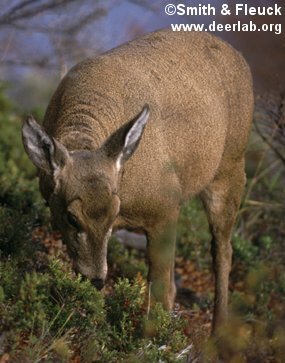 Unlike many deer, baby huemuls do not have spots but are a solid dark brown color. Females give birth in isolated areas, where the baby can hide safely from predators. Babies lie hidden in such spots while their mothers forage. Patagonian huemuls are diurnal, and have well-developed senses of vision, hearing, and smell. In undisturbed areas, they are very tolerant of people, but they may be very shy in areas where they are harassed by people and domestic dogs. They are not believed to be territorial, and males rarely fight. Many vocalizations have been recorded, including grunts and snorts (used during the breeding season) and bleats (made by fawns). When alarmed, huemuls snort and stamp their front legs. Family group: Solitary or in small mixed groups of 2-5 animals. Groups with multiple adult females are never seen. Diet: Leaves and tender shoots of shrubs and trees, very rarely grass. Main Predators: Puma, domestic dogs; foxes, small cats, and birds of prey may hunt young huemuls. Patagonian huemuls live in rugged mountainous regions in the southern Andes. Usually they are found at altitudes between 900 and 1,700 m above sea level; they cannot survive in areas with over 30 cm of snow cover. Their preferred habitat includes areas with dense shrubs as well as temperate forest. The approximate range is depicted in the map below. IUCN Red List: Endangered (2008). CITES Listing: Appendix I (2009). Threats: Hunting, habitat loss, depredation by domestic dogs, diseases and competition from introduced wildlife and livestock. The estimated total population is less than 1,500 animals, two-thirds of which live in Chile.